SEAWINGS is privileged to offer these superb flying boat volumes for you to purchase with the special permission of John Evans, the Publisher and noted flying boat historian, sales of which will help support the SEAWINGS operating fund. All titles are brand-new and are supplied direct from the publisher to you. These books will form a superb addition to any flying boat enthusiasts book shelves. John Evans has written and published a limited run book on a cocker spaniel who became a mascot for wartime 422 Sqn Canadian Sunderland squadron. 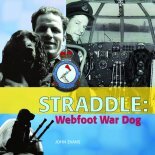 In good maritime aviation and U-boat hunting traditions he was aptly named 'Straddle' and flew several operations. These and many escapades were recorded in his flying logbook which forms the basis of the book. SEAWINGS say's....."Another cracking story from the pen of respected flying boat author John Evans. Different but absorbing, well illustrated"
Packed with photographs & extensive captions, this book traces the story of the 'Queen' from biplane forebears to last flying example. First of the series - originally published in 1987. Reprinted (5th time) 2011. SEAWINGS say's....."First of the tri-series, setting the standard with clear b/w & rare colour images and highly authoritive captions showing bases, crews and of course the Sunderland. Highly recommended to all flying boat enthusiasts". First published 1993, compliments Volumes I and III. Many photos from private sources, previously unpublished. SEAWINGS say's....."Containing even more superb clear b/w Sunderland images, many from private collections and thus not seen before. Together with more colour images, this volume continues the theme and provides excellent reference material". Packed with detailed and informative captions, this is the latest in the author’s highly praised series on this most iconic of British aircraft. An all new selection of photos of the ‘Queen of the flying-boats’, in peace and war, at home and overseas. SEAWINGS say's....."John Evans has excelled himself with this, the third of the series. Yet more magnificent b/w & colour pictures showing many aspects of crew life and their Sunderland's, at war and peace. Again, highly recommended". Traces the story of "Two-Ten" from the Great War flying Sopwith fighters to the end of the Sunderland era in wartime. Printed 1999. SEAWINGS say's....."Superb b/w pictures and a high authoritive and informative text makes this book a fascinating insight into a flying boat squadrons life. A really good read, as if you were there, with many illustrations. Couldn't put it down". Pictorial of RAF Pembroke Dock (1930-59), once the largest operational flying-boat station in the world, with photo's & detailed captions. Reprinted for the 7th time! SEAWINGS say's....."Well presented monograph featuring superb b/w photographs with informative captions showing the story of the famous flying boat base at Pembroke Dock. Views, squadron personnel and of course, lots of flying boats; it's all there". By Air Commodore John Clements. SEAWINGS say's....."Here's one for the technically minded. Very interesting autobiography with a subject that has not been covered much, if at all. Different and very readable". (ISBN 1870745 01 9) is now only available through the Bednall Family. For forwarding information contact SEAWINGS Shop direct.